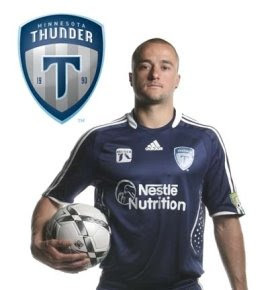 Over the past few weeks, there have been some rumors that a whole host of players with the Minnesota Thunder would be moving south to the Austin Aztex. Those rumors are all the more believable with today's report that the Minnesota Thunder released all the players they had under contract last week. Add in Austin cutting ties with 14 players from last year's squad and Austin's new CEO, Djorn Buchholz, coming over from the Thunder, and one would expect that in Year 2 of the Aztex, they will look a lot like the Thunder did this past season. Although, with both Austin and Minnesota missing the 2009 USL 1st Division playoffs, it remains to be seen if that is a big upgrade. The other fun part to this is that the TOA was supposed to be submitting their application for a new league to the US Soccer Federation and I believe Minnesota was supposed to be one of the eight teams in the proposed league. - Devo had an article in Saturday's paper about the progress of the suites at Rhinos Stadium. Rob Clark is quoted as saying that Adirondack Sports Club, his corporation that runs the Rhinos, lost $1.8 million last year, and this year's projected loss is $850,000. Before the 2009 season started, I believe the stated goal of ASC was to break even in 2009 and then look to be profitable in 2010 with the suites completed. I wonder how much a $950,000 loss reduction is sitting with the powers that be at the Rhinos? - Sam had some strong comments about the leadership within The Stampede on Saturday's show. I would hold up Section 8 in Chicago as a group that should be a benchmark for anyone starting up an independent supporters club. - Bob Bradley has named his roster of 22 for the upcoming match versus Slovakia. Who is the more unlikely name on the list - Jeff Cunningham or Eddie Johnson? - Greg Lalas wonders if the Chicago Fire are a team of destiny after getting past New England in the first round of the MLS playoffs. - Former USMNT assistant John Hackworth will be Peter Nowak's right hand man in Philadelphia per SBI.net. - Red Bull Arena's roof is complete. - There is more about the MLS players potentially striking. - I like this tournament to decide the next DC United head coach.